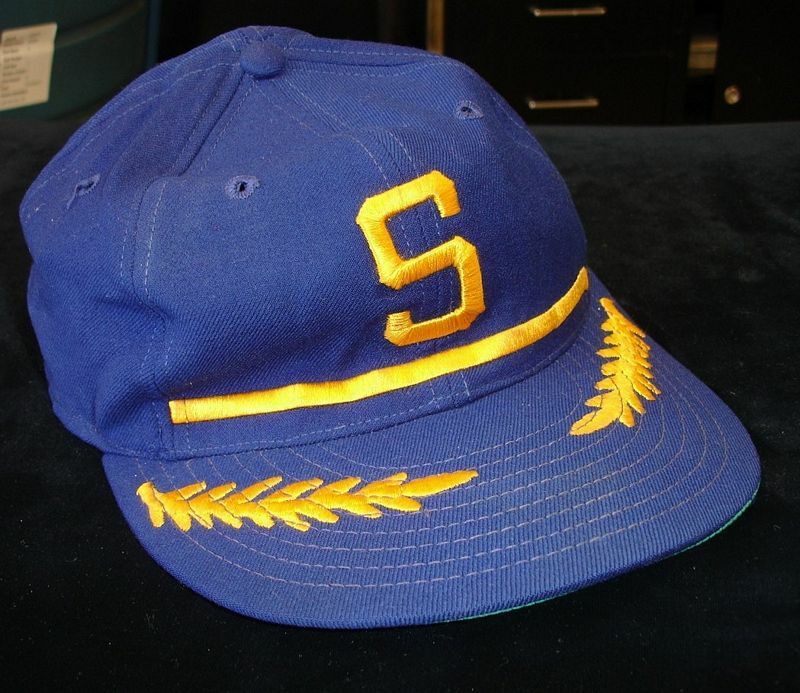 The Pilots played just the 1969 season in Seattle before moving to Milwaukee. For a team that played one season they had a surprising array of jersey designs, cap designs and cap makers. The prototype cap had an S like a lightning bolt (with line and gold stalks). 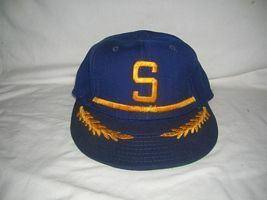 Spring training caps had the S logo as seen here but without the line across the front and the gold stalks on the bill. As for cap makers I've seen Wilson, KM Pro and New Era all game used. BUT COLLECTORS BEWARE! See warning at bottom of page. Spring training caps had a gold S without the line below it or the scrambled eggs on the bill. If anybody has one, please send photos! 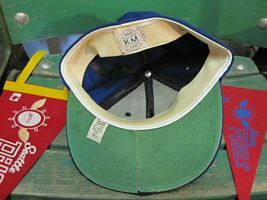 Wilson caps have a satin undervisor. 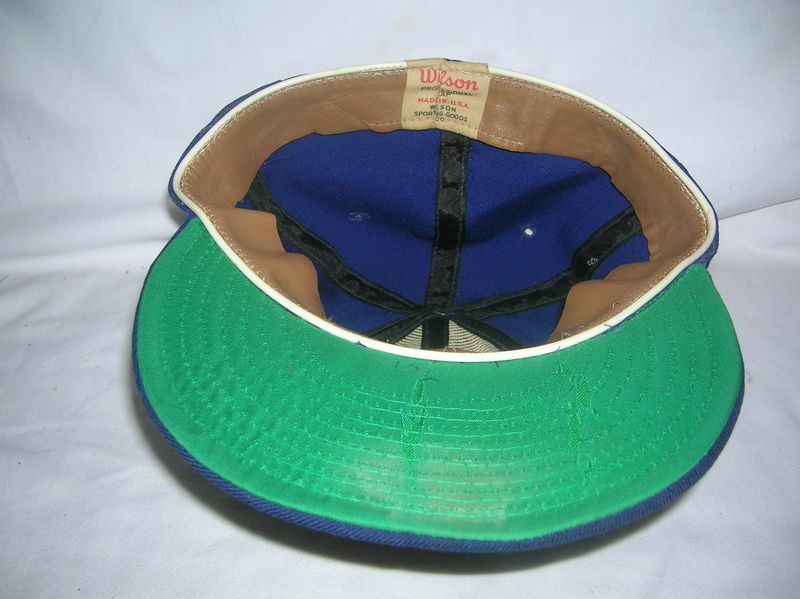 These caps were made for Wilson by New Era. 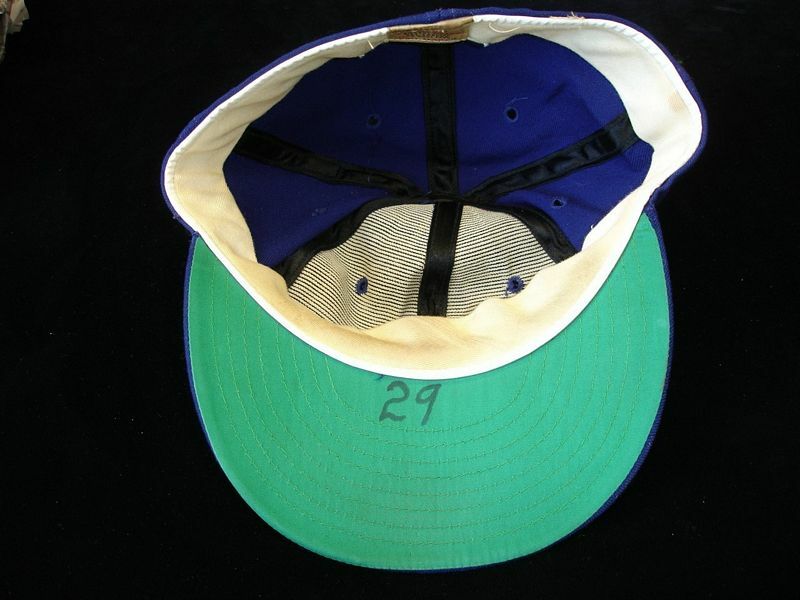 This is Jerry McNerty's cap. It has a Wilson date code of APC which is November 1968. So these caps were ready long before spring training 1969; Clearly the Pilots were waiting till opening day to unveil their interesting new look. Note the "S" is slightly different. A KM Pro just like this is displayed at the HOF. 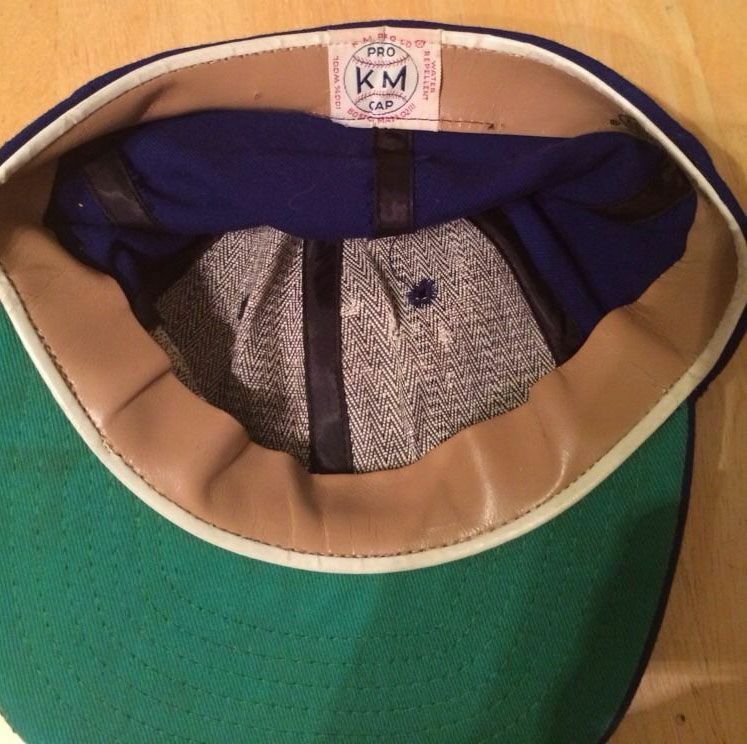 And for good measure, here's an exact game-style KM Pro cap with a leather band. And finally the New Era game used version. Note it has 8 rows of stitching on the visor. Looks just like the Wilson cap, as it should, since New Era made the caps for Wilson. The replica below, as we shall see, does not. 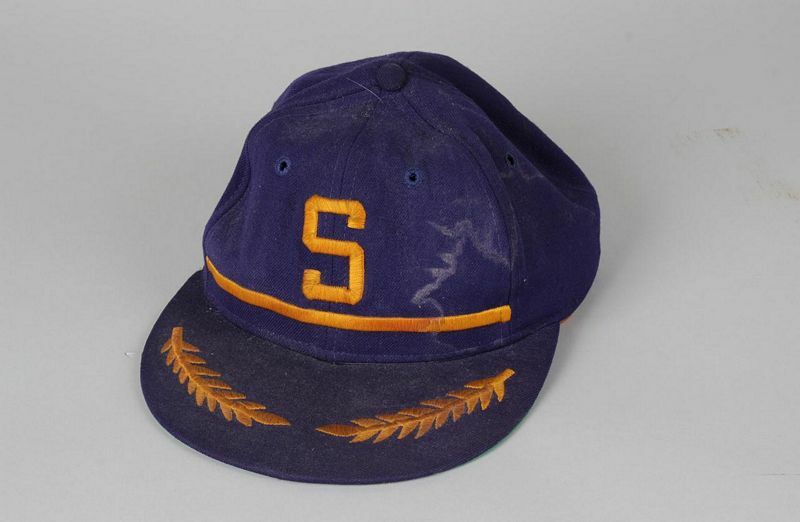 This cap was listed by an auction house as a game-used Don Mincher. Upon requesting provenance, I was told it came from a "reputable source". Persisting, I was then informed "not sure if we have any further information". Aside from the obvious issue that Mincher wore #5 with the Pilots, not #2, there are more indications appearing to preclude it being a 1969 cap. Compare it to the verified New Era game cap above. 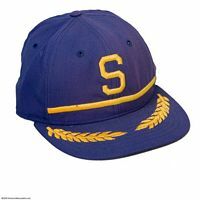 That cap has stitching on the visor, but this one doesn't - like the New Era Cooperstown throwbacks of today. Second, the gold stalks on this cap are much further from the crown, almost at the edge of the visor - again, like Cooperstown caps today. Now, note the stitching inside on the leather sweatband where it attaches to the plastic reed (white ring) - on game used caps I've seen, until 1971 it was a zigzag pattern like the New Era-made Wilson cap above, NOT a straight line stitch pattern like this cap. Conclusion - this cap matches the construction of mid-1970's and later caps. It does not match the construction of a late 1960's cap. 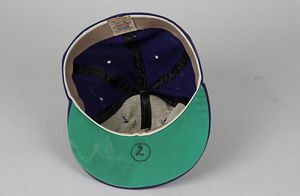 It's probably a replica; New Era started selling replica caps to the public in 1978. SO BE SUPER CAREFUL EVEN WHEN BUYING FROM REPUTABLE AUCTION HOUSES. 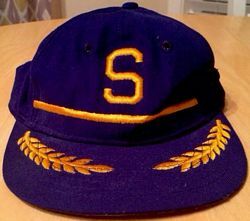 NOW, IF ANYONE CAN PROVIDE CONCLUSIVE EVIDENCE PROVING THIS CAP STYLE WAS WORN ON FIELD BY THE PILOTS IN 1969 - PLEASE LET ME KNOW!!!!!!!! COLLECTORS SHOULD ALSO BEWARE OF ROMAN PRO CAPS LISTED AS "AUTHENTIC". ROMAN PRO DIDN'T EXIST UNTIL 1977. BE WARNED!!! After the 1969 season the Pilots relocate to Milwaukee.